*First of all she LOVES her mommy! She wants to do everything I do and follows me around saying, “I TRY?” She is a great helper!! She loves to clean, cook, obey:)…for now anyways! *She loves to read….and we truly sit for a good hour every day and read her bucket of 50 books…Ben thinks I am crazy for reading for so long…but I have already seen how quickly this time will go by! *Little Rabbit Foo Foo *Where is Thumbkin? C: “Ohh, dirt… pointing to something else…What’s that? 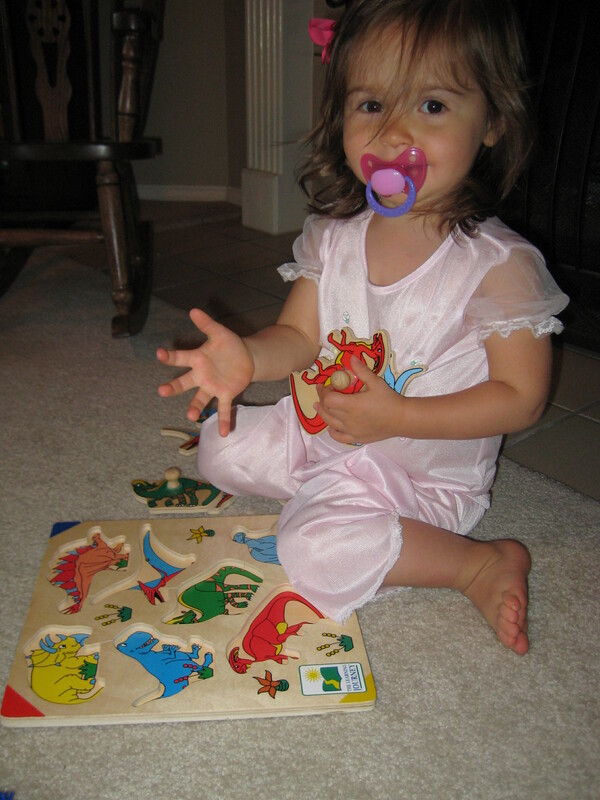 *She is our night owl…every night we put her to bed she says, “COUCH! COUCH!”…she wants to cuddle with her daddy on the couch! *She loves to count…I will put a few grapes on her plate and she will spend most of her time rearranging and counting them instead of eating them. She can only count to 10. *She is potty trained!! It only took a small effort on my part…and she did the rest! She loves wearing big girl underwear! Her tiny-hiney in underwear cracks me up! My sweet little girl will be 2 in a couple of weeks! I truly cannot believe it. I love you sweet Caroline! I undoubtedly have the best mom EVER!! She was visiting from OK so we all celebrated with lunch at the Blue Goose!! I kept my niece’s last night…and the kids had fun making crafts for Nanna’s birthday. We went to the store to pick out flowers/balloons/gift…the kids were so excited!! She came over this morning and opened the door to all four of those precious little souls singing “HAPPY BIRTHDAY!” If you know my mom well at all you can guess what she did………CRIED!! She then opened a hand print picture from all 4 kiddos and read the poem on the back and of course……….CRIED AGAIN!! The flowers the grandkids surprised Nanna with! So I was prompted to do this post by my friend, April. What are the moments in time that you would love to do again, be again, eat again, feel again, hear again? Wow! This has had me thinking all day…so here goes! Sweet moments, won’t you come again? ~Feeling the freedom I felt the day I turned 16 and had my very own car to go wherever I wanted and whenever I wanted! I remember feeling giddy every time I got in my car those first few months. I turned the music up loud and just drove around with no destination in mind. The freedom! ~ Going on family vacations to Grand Lake. Totally care-free…with no other agenda but to have fun. Not thinking about the future…just totally living in the moment! ~Going to a convenient store with my dad, him giving me a brown paper sack and letting me fill it with all the candy that I wanted! Ahhh, makes my mouth water! ~Knowing that someone is really proud of you. My mom was always so proud of me…academically and athletically. I could see it in her eyes and she told me often. ~Competing!! The feeling I got when I got to compete! It started with softball, moved to competitive gymnastics for 4 years and then competitive cheer-leading. I LOVED the feeling you get when you are getting ready to step out on the mat…the excitement…the challenge of having to be your very best at that very moment…the pure joy of winning! This was all that mattered in the world to me at that moment…putting into place all of the HOURS I had practiced for that moment in time. I seriously still get all worked up with that tingling feeling just thinking about it:)!! ~Experiencing Christmas Eve’s with all of my cousins! We would open piles of presents for hours. The laughter and true joy that filled that room! ~Having a crush on a boy…and all of the excitement/heartache that came with it! ~Coming home from school every single day to the largest bowl of Chocolate Almond Ice Cream ever….yummy! ~Being a first time mom with a newborn! Actually the entire first year. The feeling of the world being perfect, with a child that hung the moon, that all you have to do is love on and kiss on this tiny little miracle! No breaking up fights between siblings, no disciplining, no raising my voice, nothing but love!! ~The days of being a newly wed with nothing else to do but work 8-5 and spend the evenings any way I wanted with my husband…movie last minute…dinner in peace…naps when I wanted…little to no laundry…plenty of cuddling time:)! ~Being on an LST mission trip and knowing that you are doing exactly what God would want you to be doing…sharing Jesus! After thinking and reminising about the first 30 years of my life…I have come to one conclusion…I am blessed beyond words!! I will now jump back into reality…having a sweet husband who is the best daddy to my sweet and fiesty children!! Piles of laundry….a dirty house…toys everywhere…scooby-doo consuming my TV…and I wouldn’t have it any other way! OK, OK, OK….so it wasn’t really a challenge:)! I forgot to let you all know that Caroline no longer has her “wekkie” aka pacifier! Since she has been born I have left her pacifiers in her bed…she only got them to go to sleep. In the morning she would happily throw them back into the crib…no problem! The minute Ben picked her up she asked him, “Wekkie?? ?”….”Oh honey, it went bye-bye!”….that was the last she mentioned it! I think she thinks “wekkie” flew away to Japan…never to return! So, there was no challenge. I didn’t have to be the bad guy! A BIG shout out to both grandmothers for taking care of this “situation” for me! I love you both dearly!! 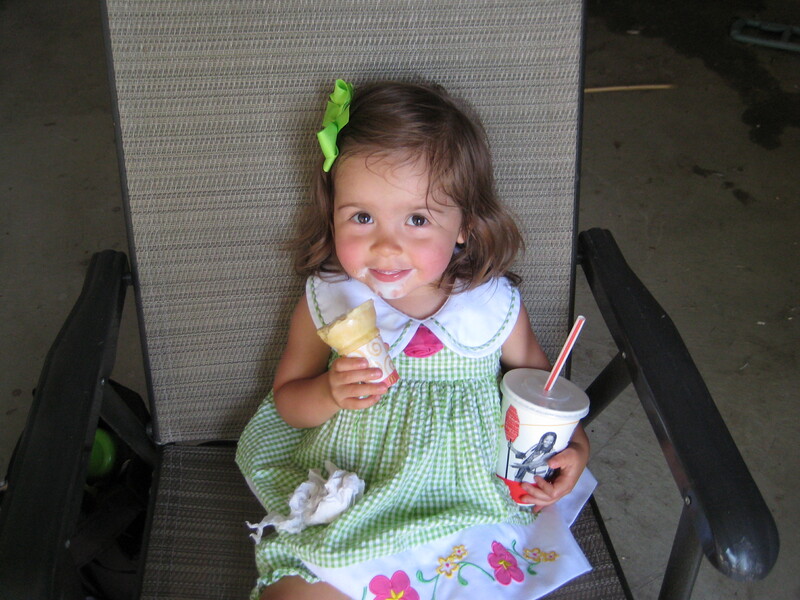 My “big girl” eating her very own ice cream cone!